Notorious RBG: The Life And Times Of Ruth Bader Ginsburg by Irin Carmon and Shana Knizhnik is the inaugural book I chose to check out with my new library card. I had initially heard of this book via Audible and added it to my wishlist there, but if we are being honest with each other — this is the kind of book that should be read physically, given all the images and the careful layout of the pages. Frankly, Notorious RBG is one of those books that manages to be both fun and educating. I’m so glad I decided to borrow it from the library! Notorious RBG: The Life And Times Of Ruth Bader Ginsburg is totally a coffee table type of book that is actually a lot of fun to delve into and very readable without being too heavy. As the title promises, this book is about Ruth Bader Ginsburg’s life and how she was a pioneer in the legal world, especially for women. We learn about her childhood and how intense she was in regards to studying. We learn how hard of a worker she is. We also learn about a love that lasted more than half a century. Further, this book delves into the workings of the supreme court and how Ginsburg works hard to get the justices who are ideologically different from her to come over to her side. It is a fascinating view of the legal victories and setbacks women have faced and how much Ginsburg has to do with some of those victories. I basically love memes and the internet and GIFs. 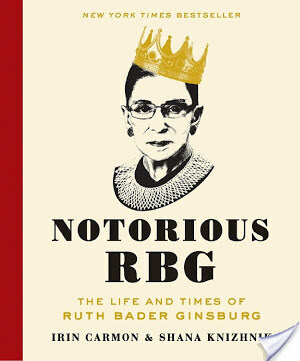 So, of course Notorious RBG: The Life And Times of Ruth Bader Ginsburg by Irin Carmon and Shana Knizhnik appeals to me. I loved how this book is very bold in discussing sexism and feminism and how cool it is that Ginsburg is feminist. I loved how it made legal theory a bit easier to understand. I think if you’ve sat through a constitutional law class, this book should hold extra interest to you because you’ll understand how the supreme court works and thus you won’t be too terribly confused about what you are reading. Overall, I can definitely see this book in civics and participation in government or social studies classrooms. I really do think it should be in high school libraries too. This book takes a woman who is so accomplished and a trailblazer and puts her story in a way that is accessible and visually interesting. This is truly a non fiction book for the tumblr generation, and so it has real educational and entertainment value.